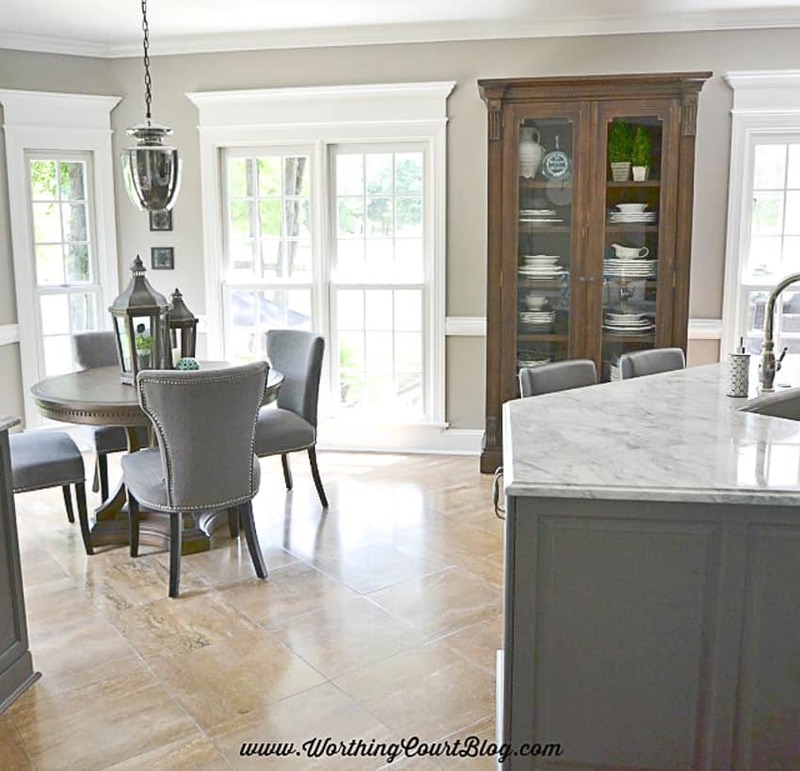 Today, I want to take you on a tour of my friend, Nancy’s, recently completed kitchen remodel. Nancy had been dreaming about and planning this kitchen for a long while. It sure was worth the wait because it is gorgeous! There’s so much to show you, but let’s start off with one of my favorites. 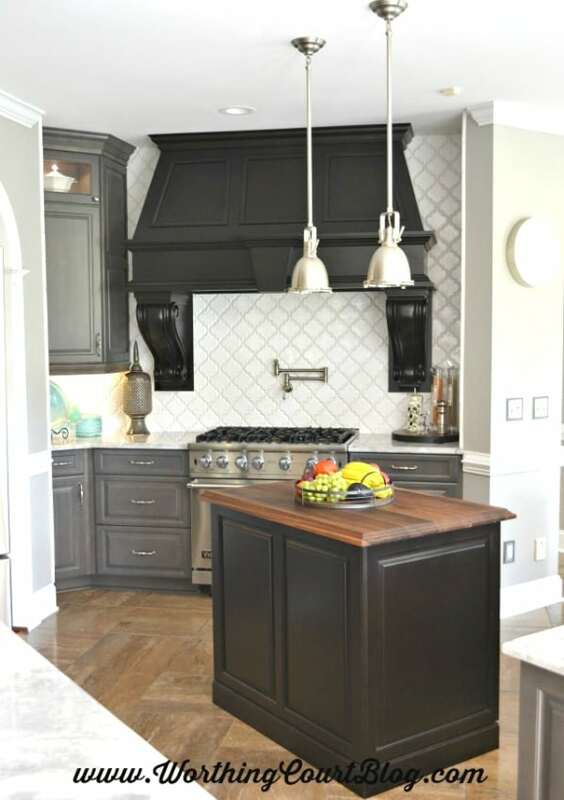 This amazing over-sized custom hood is the crowning glory to Nancy’s new Viking range. Nancy designed the hood herself. The hood wouldn’t make the statement that it does were it not for her high and low search for the largest and chunkiest corbels she could find! Don’t overlook the fabulous arabesque tile backsplash – it’s swoon worthy for sure. This is the same area before. You can see that Nancy kept the original light pendants. The refrigerator and microwave were relocated to the left of the range, on a wall that formerly held a wall oven with the microwave above it. The display nook above the refrigerator is another custom piece that Nancy designed. Nancy specifically designed its large size to showcase her many wonderful accessories. This same area looked totally different before. 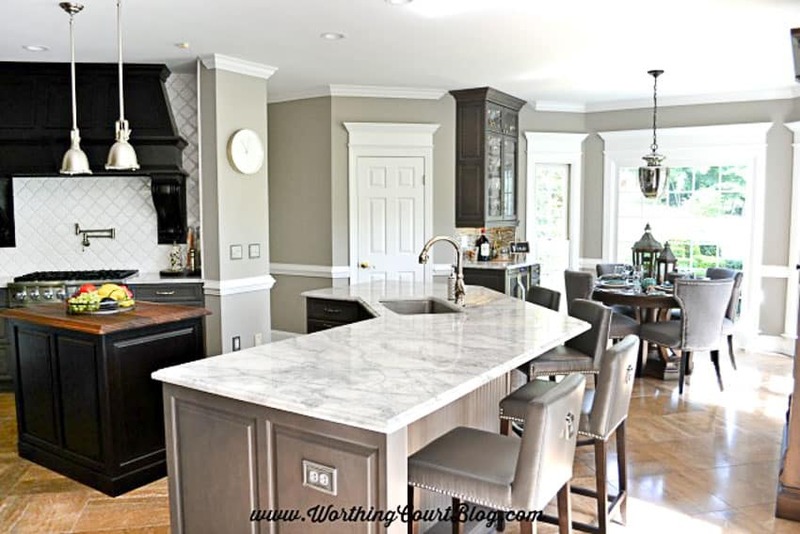 A new island with a richly stained butcher block counter replaced the old one. Nancy’s home has a very open floor plan in the main living areas. 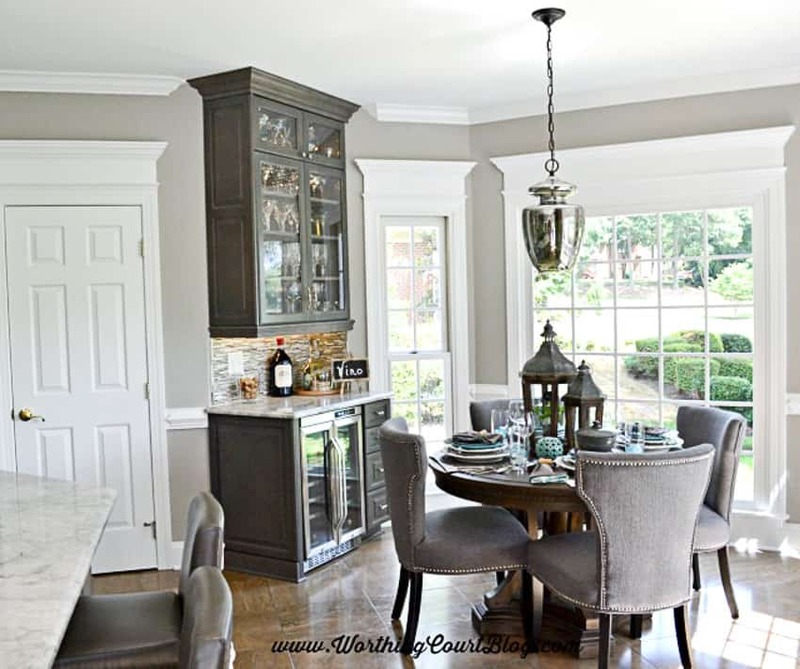 In several of these photos, you get glimpses of the family room and dining room that her spacious kitchen opens up to. Glass front cabinets with lighting give Nancy more spots for displaying favorite pieces. Entering the kitchen from the family room, you get a good look at the large island topped with quartz counters and the breakfast area. The hallway to the left goes to her laundry room and garage entry. 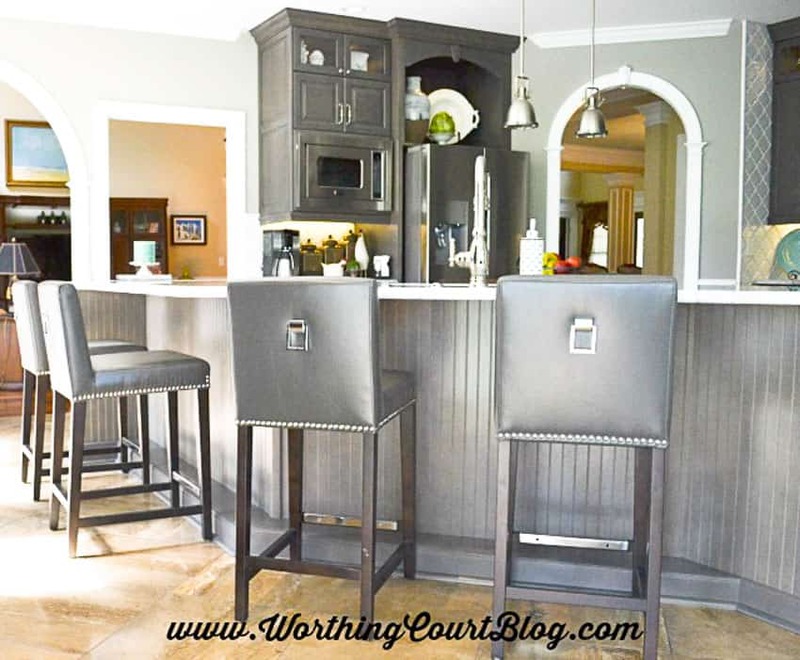 The back of the island is cover with painted beadboard and sports gorgeous leather barstools. 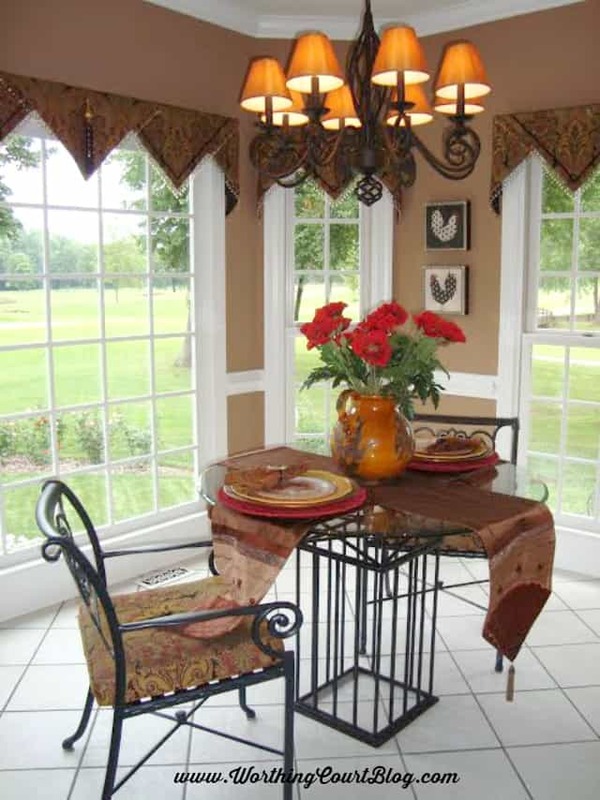 The breakfast area contains a new table and chairs and mercury glass light fixture and overlooks the golf course that her home is situated on. Nancy removed the old valances and had a carpenter beef up the trim above the windows. Leaving the windows bare gives the entire area a new look that is so much brighter and allows you to really take in the view! 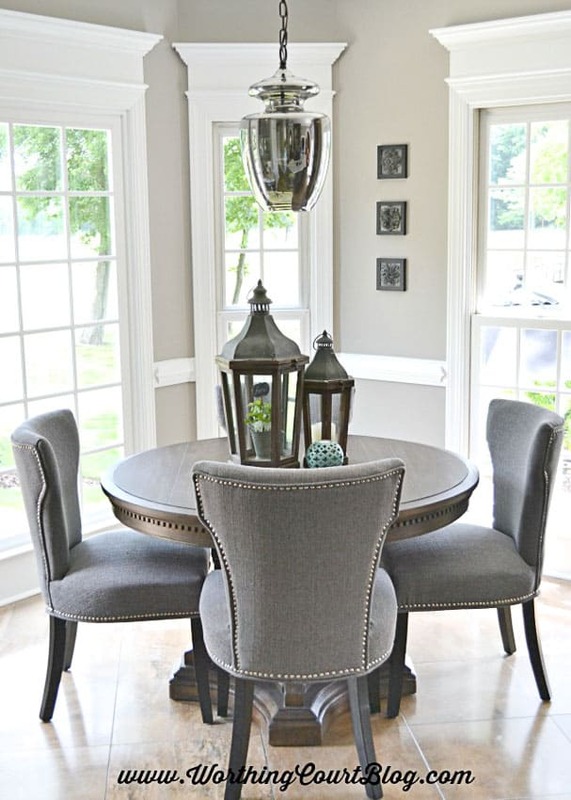 The breakfast area before was Tuscan style containing a glass top table with a metal base, metal chairs and dark fabric. 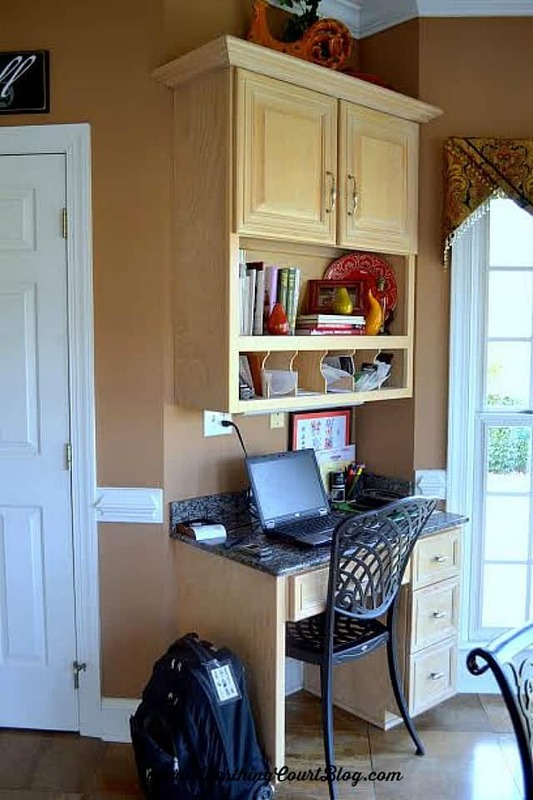 The wine bar was formerly a built-in desk. 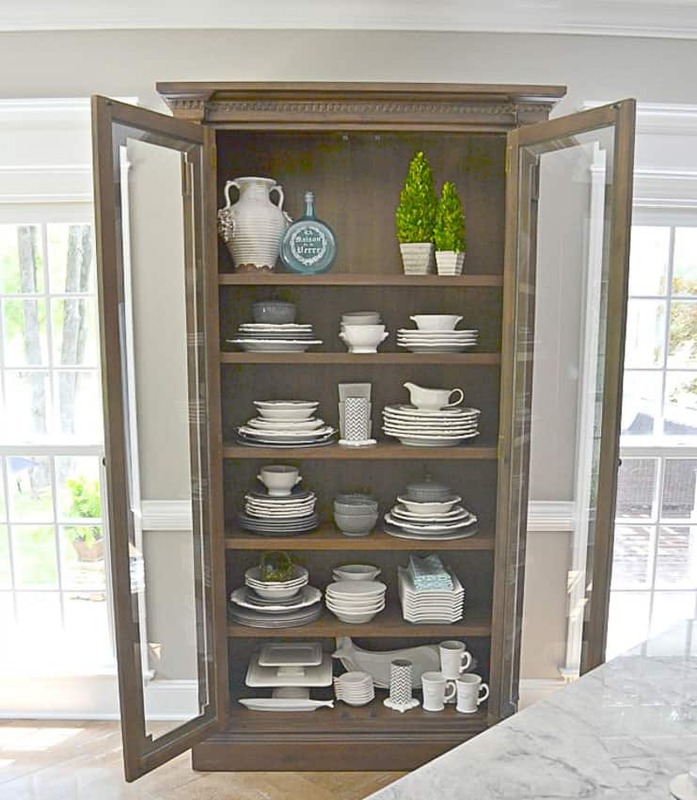 A wonderful display cabinet was added to store and showcase gray and white dishes and accessories. This is just an overview of Nancy’s beautiful new kitchen. Click HERE to take an even closer look and get the resource list. Gorgeous updates Suzy, I love the hood she chose. The hood is one of my favorite features in Nancy’s new kitchen. I’ve been enjoying seeing your new home! 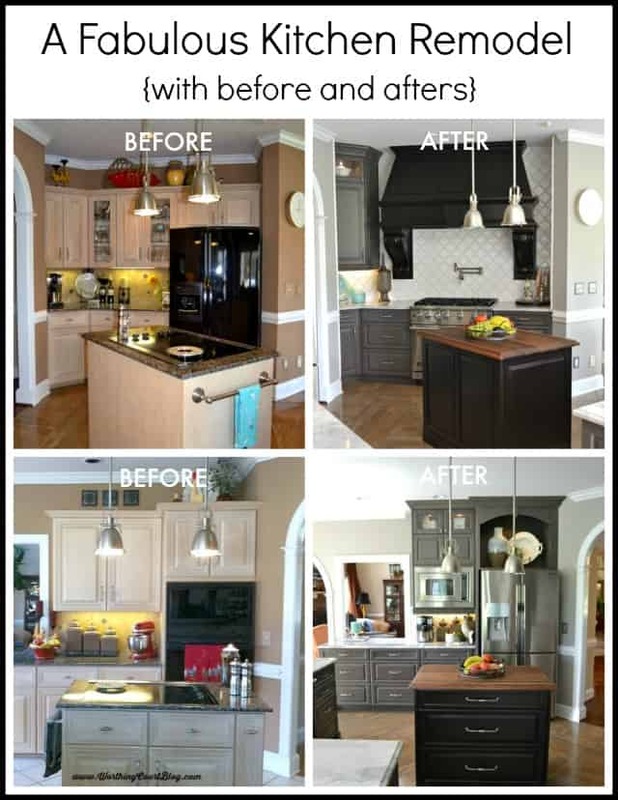 Suzy, thanks for posting my kitchen remodel : ). We really enjoy it everyday. Hopefully you will be posting about yours very soon!! Your kitchen is just gorgeous and my photos don’t do it justice! Thank YOU for letting me share it. The hood and new paint colors are great! Love the new trim above the windows, too! Stunning! I always love seeing kitchen designs that are beyond the traditional white on white on white! Thanks so much for sharing, my friend! 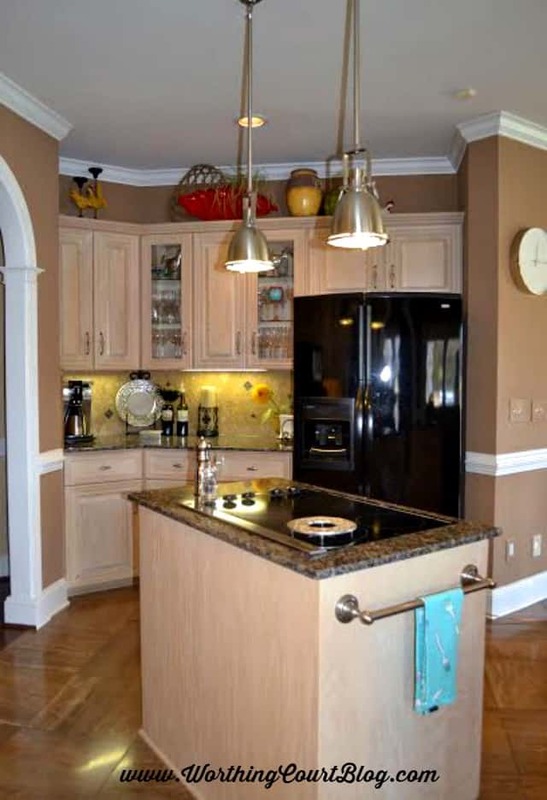 Hope all is well with your very own kitchen remodel!!! I’m glad you enjoyed Nancy’s kitchen. There’s just so much eye candy in there! Looks like I’m going to be living in that house for two or three weeks without one. Oy. I love this kitchen and your blog. I have been having a problem for weeks with an ad (I think by Facebook) that keeps locking the screen so I cannot read your blog! Very frustrating. It takes a good 10 minutes of back and forth before I can finally get past the ad? 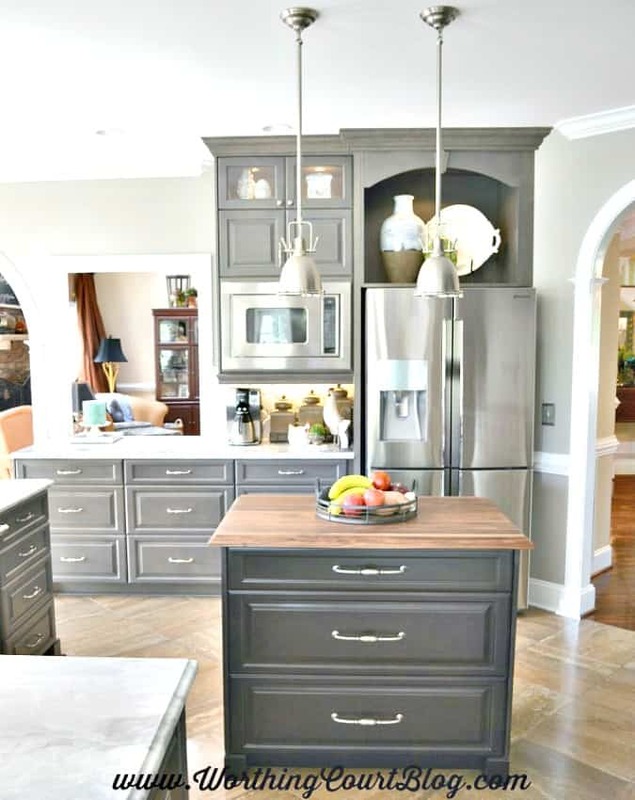 Love the gray in the kitchen, it is so much richer looking and very classic. I love your blog I always come away inspired. 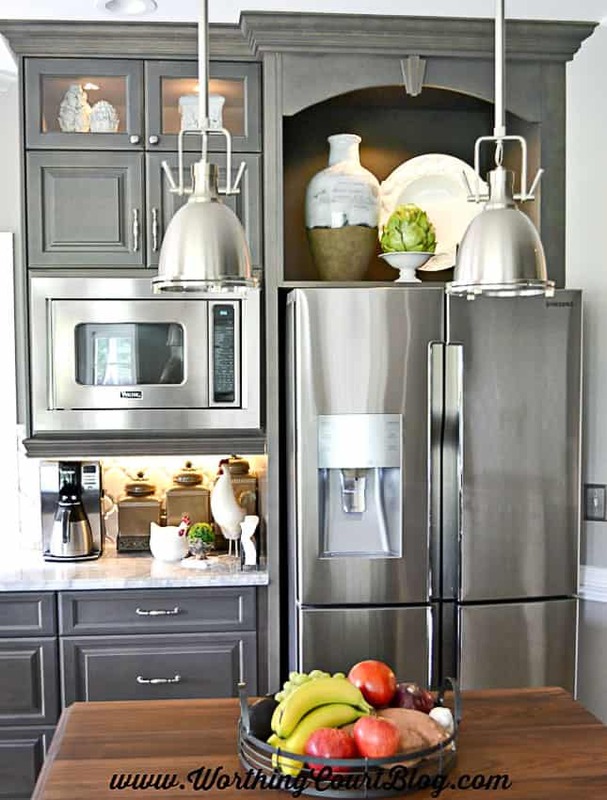 I’m really crushing on the gray in Nancy’s kitchen too and yes it’s very rich looking! Loved Nancy’s kitchen. What is the name of the grey paint she used, it’s beautiful, thank you.? Gorgeous!! That vent hood with corbels is amazing. Hi Stacey. 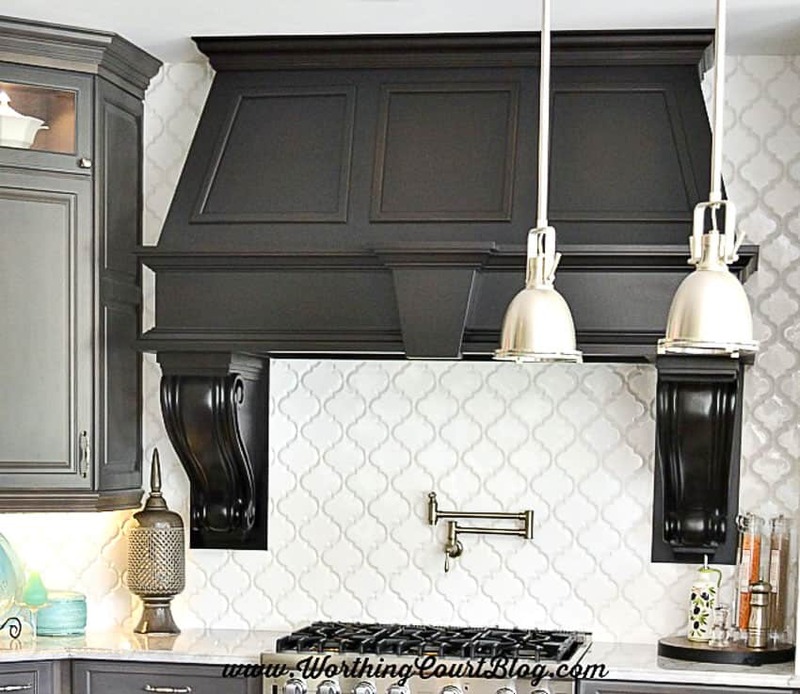 The hood and drool-worthy corbels are probably my favorite feature in Nancy’s new kitchen! Gorgeous kitchen!! 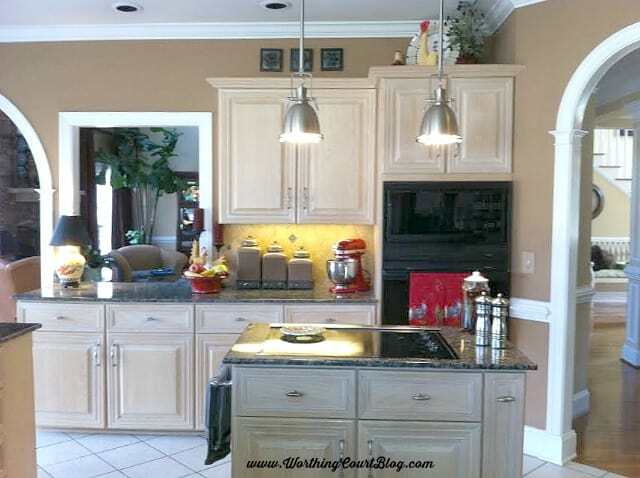 Can you tell me what paint color was used on the cabinets?! Oh wow, what an amazing makeover. I love that new hood and the layout is so much better. Thanks tons for linking to Inspire Me. WOW! This took my breath away, Suzy! Nancy, you did an amazing job, you must love your new kitchen. The black really makes a statement, and those humungous corbels are a KEEPER!!! The island actually reminded me of ours. The rich wood tone against the black is always so beautiful and timeless. I am so happy you linked up @ Inspiration Monday. I’m going to feature Nancy’s kitchen on my FB page in a few minutes. 🙂 Hope you will stop by again, Suzy! Nancy’s island reminds me of yours too, Julie. I’m glad to meet a fellow ginormous corbel lover! Thank you for the FB feature! I love the new gray cabinets. So rich and classy! I totally agree with you, Holly! Gorgeous! And wonderful inspiration! Thanks for linking up at Show Me Saturday. Hope to see you there again this week! Love, love this remodel. The colors are perfect and the hood is amazing. What a difference! Absolutely gorgeous! I love the remodel! Your friend’s kitchen is beautiful. I think she made some really good choices. what a great transition. Excellent job. WOW! One of the best makeovers I’ve seen. Its stream lined but not in cold way. Truly stunning! I love the colors she chose, the hood and corbels, and the new layout. Absolutely stunning and perfectly updated classics. Well done! 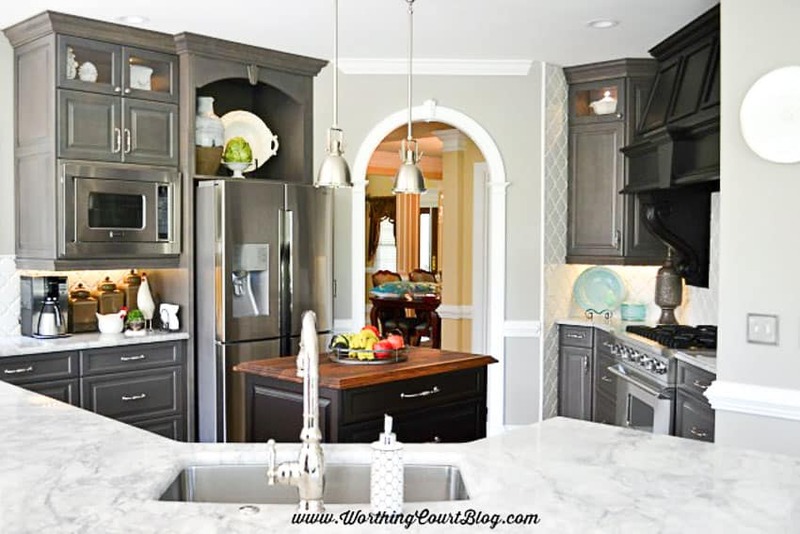 Love this kitchen remodel!Would love to see the rest of the house!